Samsung on Wednesday unveiled a Galaxy Note tablet designed to make a more personal connection with users and aiming to knock Apple’s iPad off its market throne. A key feature of the Galaxy Note 10.1 was a sophisticated “S Pen” that can be used as if it were a pen on paper or a computer mouse. “The mission of this device is personalization — using pen input to create more human communication,” Galaxy Tab consumer business division director Travis Merrill told AFP while providing an early look at the new tablet. “Receiving a handwritten note from someone you know is so much more emotional and powerful than just receiving an email,” he said. 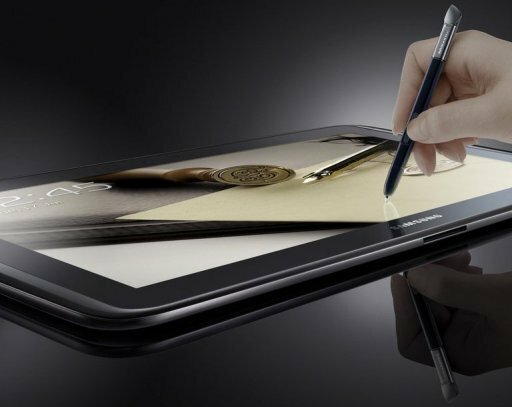 Samsung built technology from Japan-based Wacom into the tablet screen to create a layer that can sense “S Pens” so precisely it can tell how hard they are being pressed or even if they are hovering, slightly out of touch. “If you don’t want to use the S Pen you don’t have to but it is really the heart and soul of the device,” Samsung Telecommunications America product strategy director Shoneel Kolhatkar said. Note 10.1 tablets are powered by Google’s latest generation Android software and feature powerful quad-core processors as well as two gigabytes of RAM for quick handling of videos, games and other graphics rich content. The tablets are Wi-Fi enabled to connect with the Internet at hotspots and will be available in the United States on Wednesday at prices of $500 for a 16-gigabyte model and $550 for a 32-gigabyte model, according to Samsung. The launch of the Note 10.1 will be accompanied by a massive promotional campaign, according to Merrill. “We are betting big on this; not just on the tablet but on the Note brand,” Merrill said, indicating that Samsung felt that it struck a chord with its Note smartphone that provides an Internet Age note or drawing pad experiences with a stylus that serves as a virtual pen or brush. Samsung has sold about eight million Note smartphones worldwide in the seven months since its release and believes people want to interact with touch screens more accurately and effectively than fingers allow, said Kolhatkar. Software in the tablet lets users hand write notes or scrawl comments on images or documents and then store them or post them to social networks or send them in email messages. A service in the tablet recommends applications designed to run well on the hardware or which are customized to take advantage of S Pen capabilities. The tablet also knows to ignore pressure from the palm of someone using an S Pen, freeing users to write or draw naturally. Note 10.1 software can convert handwriting to text or crudely drawn objects to crisp geometric figures, and even correct written scientific or mathematical formulas, according to the demonstration. Samsung worked with Adobe to make free Photoshop software that allows people to use S pens to edit images on the Note 10.1 with accuracy and ease. Movies, games and other entertainment content for devices are available at a Samsung media hub, along with a growing “ecosystem” of applications made by third-party developers. Samsung also built “personal computing” power into Note 10.1 by letting users engage in several tasks at the same time, perhaps watching a video while working on a presentation and roaming the Internet.